Im not sure if it was my first IBC, but I do remember the Metropole Hotel, Brighton. Even then, the exhibition was rapidly outgrowing the space and so the company I worked for pitched a large tent on the beach to house our product demonstrations. We called it the Slug because, well, it looked like one! I know we worry about producing flawless demos these days, but 1989 saw an incredible storm with some of the highest winds ever recorded in the UK. Although the flapping canvas caused some distraction, it was fortunate the kit was so large and heavy in those days, as it was surely the only thing preventing the tent flying off down Brighton beach that year! 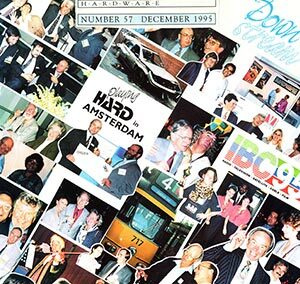 In the 1990s IBC moved to Amsterdam and today it is attended by around 55,000 delegates from more than 170 countries. The exhibition is slick and well-organised but sometimes the exhibitors remind me of swans, looking serene and elegant on top of the water with those little legs paddling frantically beneath! A prime example was one year when I was scheduled to present a keynote speech on How to Do Business in the UK. Wed been out to explore Amsterdam the night before and when I got back to my hotel, somehow, I was locked out of my room. Nothing the hotel staff could do would unlock the door and so I was resourcefully offered a camp-bed in the less-than-luxurious staff quarters. I was first-up for my presentation the following morning: but without access to my wardrobe, I looked somewhat disheveled. Unshaven and still dressed in the same cloths as the night before, Im not sure I gave the very best impression about doing business with the UK. But as they say: the show must go on! However, Im sure it had been an entertaining evening the night before, as they all were. Memories are murky but it may even have been the year where our team had hired a black Mercedes for transport for the week. We often got mistaken for a taxi but it did allow us to maximise the use of our time by driving down the tramlines without penalty! It backfired one evening though when we lost the car. The only thing our nominated driver could remember was that hed parked it next to a canal! On another occasion, a group of us went to sample what we called the iPad Chinese Buffet (its real name was Royal Fook Long I kid you not!) Its a fun place: the idea is that you make your menu selection on an iPad given to you on arrival. Eight minutes must elapse before you can re-order from the buffet. Dutch not being any of our teams first language presented only a minor issue. We got around what was lost in translation by simply pressing as many menu choice buttons as we could, then waited to see what food arrived. Luckily despite the vast quantity, the cooking was delicious and we did our best to tuck-in! We were making good headway when, less fortunately, a pint glass was accidentally knocked over by our waitress, spreading a combination of beer and smashed glass into our meal. We were rapidly escorted to a new table. However, somehow this re-set the original iPad menu choices and, at neatly timed at 8-minute intervals, all the food wed already eaten started arriving again! That was a big night! Back at the exhibition itself, one notable omission from modern day IBC is, of course, the IBC Pub. A re-created English pub, which for a number of years, took-over the walkway near the exhibitions front entrance. It was a wonderful place to meet colleagues during the day for an informal catch-up plus a warm pint of beer. The IBC Pub, now aptly named: Not the IBC Pub, with the help of industry veteran Phil Reed, occupies a real pub in Soho, London for an annual Christmas get together and Media Links tries to sponsor it each year. A beach and womens volleyball has now taken over where the IBC Pub was once stood I guess there are pros and cons to every situation! IBC is always an amazing opportunity to catch up with friends, acquaintances and to meet new contacts making this industry unique in its sense of community. As newcomers will discover, as much goes on outside the exhibition halls as inside and I hope sharing a few of my more printable memoirs stirs-up some good recollections from the more experienced generation! Re-telling these tales heightens IBCs kudos as an event which brings the industry together to do business and to socialise, setting it apart like no-other. This year, Ill be making more memories at the Media Links booth 1.C31 and I anticipate hearing some new stories to make me chuckle while I conduct some flawless product demonstrations and of course, execute some outstanding business at the show. Whatever happens, the show will go on! I look forward to seeing you all there!